Folk singer Hollie Haines is launching her new album The Letters To My Last Love as a pop-up at Old Street Underground - in the tunnels under the roundabout that lead to the tube station - for six days from Monday 4th - Saturday 9th February 2019. 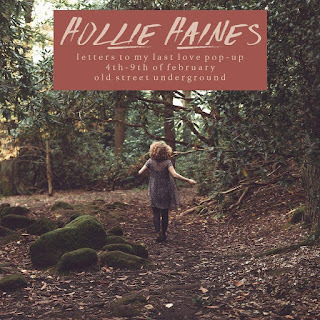 Hollie will be there herself for the whole time, with musician and artist friends, so pop in to enjoy a chat or listen to some music. Musicians have used pop-ups before - for example Enter Shakiri opened a pop-up shop in Camden to promote an album three years ago - but this is far more extensive. Well done Hollie! "I'm so excited to announce that after the release of my 7-track concept album Letters To My Last Love I will be taking up a week long residence at one Old Street Underground's famous Pop-Up spaces to bring Letters to life in an immersive installation. Alongside some wonderful artists and musicians the Pop-Up will include live music, art and a chance to follow the journey of love, healing and discovery that the album carves out. Join us anytime during the week to explore the experience yourself."